﻿If you mainly connect the name Brahms with opulent symphonies, passionate concertos and weighty piano music, you will be in for a big surprise when you listen to the Intermezzi op. 117. The music critic Eduard Hanslick talks of a more restrained, detached style and clearly means the calm, simple and immensely expressive flowing melodies, which characterize the late piano music of this Romantic composer. Just how sensitively the performer must tackle these precious miniatures is described by Clara Schumann with the words »… the intellectual technique in them demands a fine comprehension and one must be very familiar with Brahms to play them as Brahms had imagined them«. 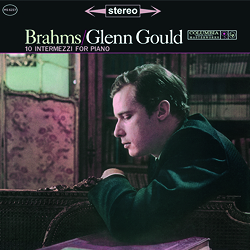 When it comes to Brahms, Glenn Gould – famous for his analytically strict and emphatic interpretation of Bach’s keyboard works – proves himself to be a true poet and thinker at the keyboard. Driven by the melancholy force, his thoughts find their way, sometimes hesitantly, then moving on with a deep breath, as it were, to the next deceleration. In op. 118 no. 1 the Canadian pianist begins with a passion that wrests expansive cascades of sound from the keyboard, then finds his way back to introvert mellifluous tones (op. 118 no. 2) and increases the drama in the will-o’-the-wispish and futile attempts to come to a redemptory final cadence (op. 118 no. 6). It would be hard to find a more closely-knit and intense rendering than on the present recording.